Top 5 climbs around Bright - LA VELOCITA. 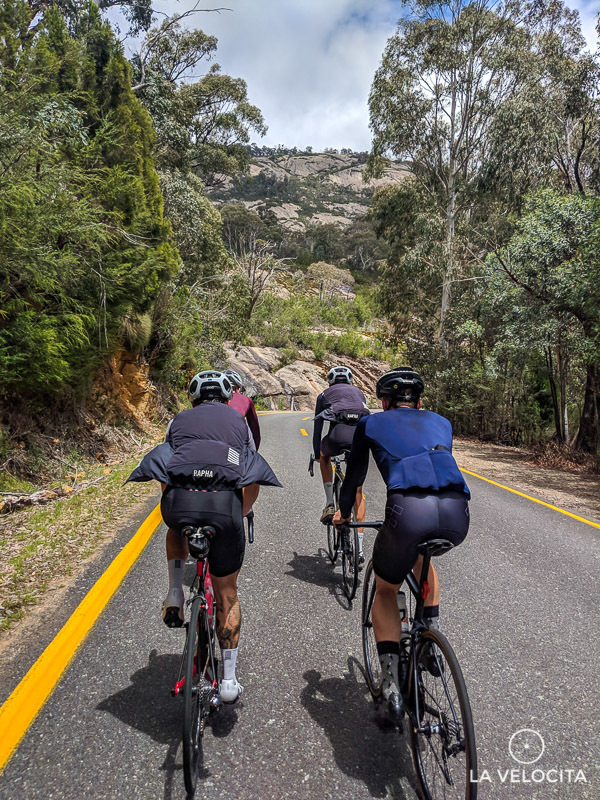 Finally after years of saying “next year” I mooched a ride off some mates racing the Tour of Bright and headed over for a week of alpine climbing. It was truly incredible. Many kilometers, and thousands of vertical meters later, I wanted to put together a list of my favourite hills in the region. These are the big-name-obvious climbs so you’ll have to look elsewhere for a deeper dive into the region’s hidden gems. Hopefully this article inspires some more people to head there for the first time and helps them to choose what to do. For those well-versed in the region, feel free to drop your own top-5 list in the comments or on our Facebook post. Before we start, please excuse the phone photos, there was no posing on the whole trip so this was all I had! The other side of Falls is the Dr Jeckyll to the Back of Falls’s Mr Hyde. It’s a 30 km stretch of spaghetti tarmac draped over lush forests designed to safely deliver tourists and supplies to the village. The gradient is consistent and relaxed, the road is wide, and the tarmac is in very good condition. It’s long - over an hour for the KOM - but surprisingly chilled. It doesn’t cook your legs with savagery; the first 16 km feature constant undulations while maintaining gradual upward progress. 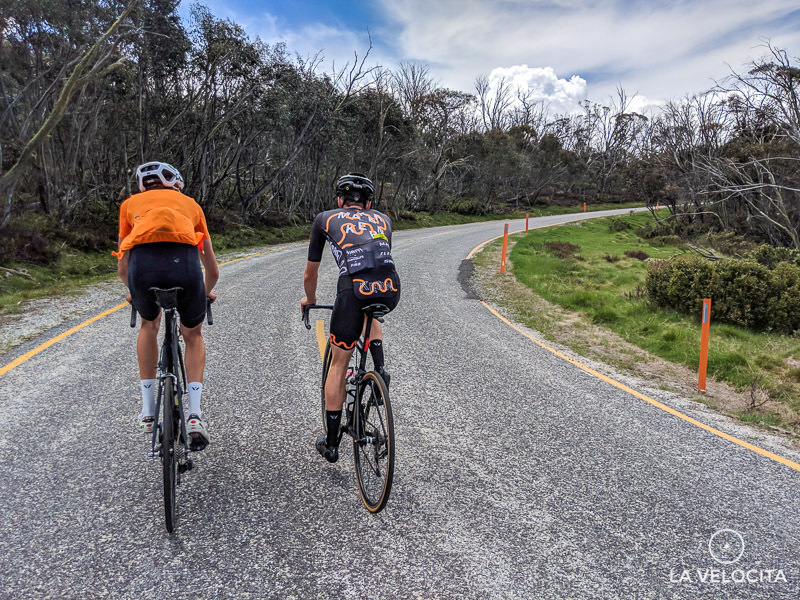 The views are lovely as you wind your way through the lower slopes, past the beautiful town of Bogong, and eventually reach the business-like gradients about half way into the climb. Everything gets lush, and stay lush, at the 16 km mark for the climb proper. The road maintains 4-7% gradients with impressive consistency all the way to the Falls Creek Village. Really, the only remote criticism I have for Front of Falls is the lack of gravitas. In a region of burly brutes and stunning beauties, this road gets overshadowed. It is, nonetheless, a pleasure to climb. It’s more notorious as the first descent of the Peaks Challenge but those who grind their way up it will have a darn good time. 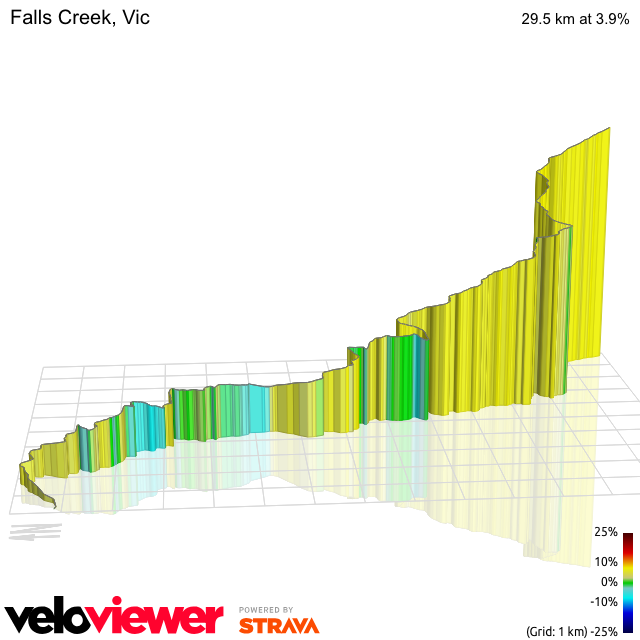 Contrary to every other climb I did in Bright, this side of Falls Creek adds cruel gradients to its punishing length. It’s a hard climb to enjoy at times, but it deserves its spot on this list. I love a steep climb but this is an entirely different beast to the punchy bergs I’m used to. The intro to the Back of Falls is the infamous “WTF Corner” - surprisingly not named for the appropriate shock at seeing it - and the 5 kilometers that follow it are grotesque. The gradient yo-yos from around 10-15% for that section. Oh, and it’s the hottest part of the climb too. Awesome. This was the only time during my stay in Bright that my 34x30 gearing didn’t feel like enough. The first, all too brief respite, comes around 6 km in with a few hundred meters of descending before it ramps up again with 5-9% gradients for a 3 km stretch. Relief finally arrives around 12 km elapsed with a section of gentle ups and downs to clear the lactic acid from your legs. 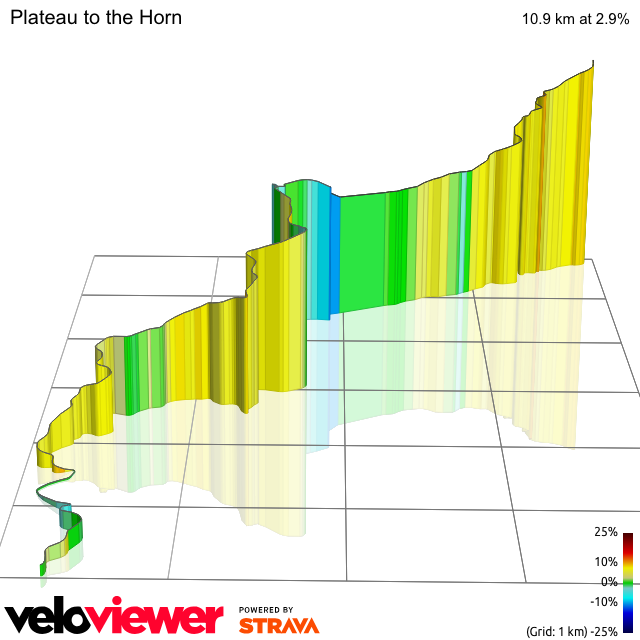 The final 8 km are where you get to properly enjoy the climb. The temperature drops, the gradient slackens off, and the alpine scenery emerges. Thick trees give way to more sparse foliage and short grasses. You’re finally done after 22.6 km and a small sign marking the end of the climb. The next 15 km to Falls Creek village are jaw-dropping. Enjoy! You’ve earned it. It feels truly ridiculous putting this climb on the lowest step of the podium but hopefully numbers 2 and 1 will explain why. Buffalo is an absolute treasure. It’s a perfect mix of excellent tarmac, fabulous views, and a dead-end road that means the only people going up and down are there to enjoy the experience at the top. Its almost metronomically consistent with its gradient endlessly hovering from 5-7%. The only break is a small slackening off between the 8 and 10 km mark where you have a 3% gradient. The vistas are ridiculous as you wind your way through the dense forests and emerge at the exposed rock face at the halfway mark for some switchback goodness. The road plunges back into the forest for the final run to the end of the climb. Once over, the road bursts onto an open plateau where you hook a left turn and roll to the chalet for a rest and some shots of the ridiculous views at the top. Don’t go straight back down though! Number 2 is right at your feet. Here’s where I redeem myself for putting Buffalo third. I consider the section after the Mt Buffalo climb to the Horn as worthy of its own spot on this list. Its terrain is different enough to the Buffalo climb to have its own identity and a worthy contender for this list. Some people climb Buffalo and never know how good the section to the Horn is. Don’t miss out on this stretch of road! The only people excused are those who hate gravel. You gotta get a bit loosey goosey for this section. So what can you expect riding to the Horn? Surprise and delight. After the plateau at the end of the Buffalo climb, you’ll swing left and re-enter trees. You skirt around The Monolith, pass the stunning Lake Catani, then begin a stretch of sealed climbing. It’s nothing difficult; a few clicks at roughly 5% before you roll into the ridiculous scenery. The Dingo Dell Cafe marks the start of ski country as you roll across the top of the mountain. Soon after you’ll hit the gravel for the final push to the horn. It was well-cured when I rode up it, but there’s certainly slushy sections. It’s all cruisy on the way up, but you need to keep your wits about you on the corrugated and corner-heavy descent. Once at the top, there’s some ridiculous views to feast your eyes upon. Then you get to roll back down and enjoy the section over again. This section is special and keeps delivering more and more amazing moments as you roll along it. Second on this list might feel excessive to some, but I adored this segment for the unique experience. This, for me, is an easy winner to the most amazing climb in the region. For want of a better word; it’s epic. Starting on the edge of Harrietville, you’re facing down 30 km and around 1,400 m of climbing. It has a similar vibe to the Front of Falls climb with wide, smooth tarmac buried in dense greenery. The gradient is forgiving until the infamous “Meg” segment that flirts with 10% gradients but isn’t overly long. It’s a segment feared by Tour of Bright racers as it tends to split the pack apart but the recreational rider shouldn’t have too much trouble getting up it. After 10 km it flattens - just in time for you to burst from the trees and drop your jaw at the staggering aesthetics. The road continues to alternate between flat-ish with a few pinches as you climb ever-higher and the views get truly obscene. Cycling photos from this region, particularly the Peaks Challenge marketing material, tend to be dominated by the final 15 km stretch to the Hotham Village. It has to be seen to be believed as cameras hardly do it justice. It’s a mix of stinging ups and quick downs in the lead up to the final drop to the Hotham Village. There’s not much more to say beyond you just have to experience it for yourself. What are your favourite climbs around Bright? Let us know in the comments!